Maybe it's fortuitous that the Brewers are coming to town. After seemingly breezing to the wild card all season, they are now in a tailspin, only 3-7 here in September and manager Ned Yost's seat may be getting hot. Moyer and gang come through in the opener. The Phils trail the Mets and Brewers by 3 games in the two playoff races. Hamels scheduled for today, but rain is in the forecast. Phils beat the Brewers to make them feel the pressure even more (they've lost 9 of last 12). Hamels comes through. Day/night doubleheader (second of those in two Sundays). Struggling Blanton in 1st game, short rest Myers in 2nd. "According to the Elias Sports Bureau, this was just the second time in baseball history that a team swept a series of at least four games in September or October resulting in a first-place tie with its opponent in a wild-card, division or league race. It previously happened Sept. 7-10, 1978, when the New York Yankees swept a four-game series against the Boston Red Sox at Fenway Park. That series is known as the Boston Massacre." Probably won't be remembered as well since it was just the Wild Card race. With the convincing 4 game sweep of Milwaukee, the Phils are not only in the Wild Card talk but are again just a game out of first place in the NL East. Off day, so just rooting for Mets to lose, but they're playing the lowly Nats, although they did have trouble in those kinda games last year in '07. Also, the Brewers fired their manager after their debacle in Philly. 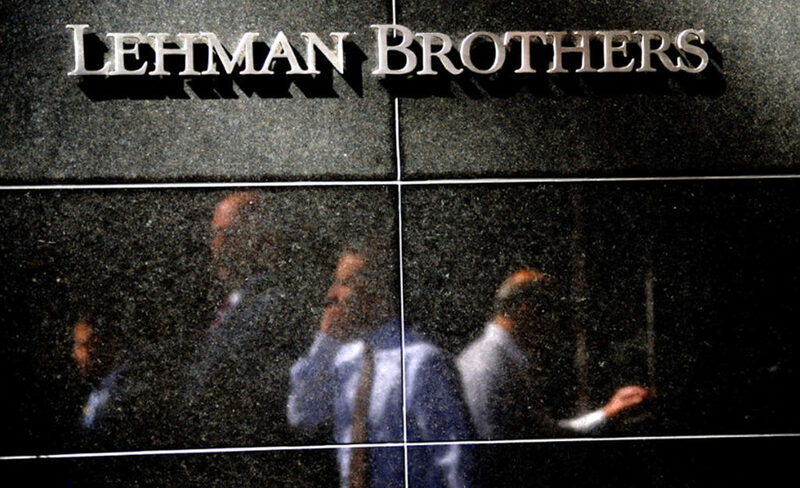 In other news, the economy--already sinking into a recession--received a serious blow with the news that Lehman Brothers filed for bankruptcy. The nation's and world's financial systems suddenly appear teetering on the brink of collapse. Mets lose 7-2 to the lowly Nats, their lead is down to a half game. "There is no panic," said David Wright. So it won't matter to them if the Phils win tonight. Ryan Howard with the go ahead homer in the 8th and the Phils beat the Braves as the Mets lose to the Nats again and the Phils are back in first by a half game. The slumping offense has vanished. Brett Myers is a front-line starter again. Jimmy Rollins is no longer at the center of controversy. Ryan Howard is once again making an MVP push in September. J.A. Happ makes his fourth career start for the first place Phils. Phils and Happ cruise past the Braves. Mets won too so lead is still a half game. Going for the sweep in Atlanta tonight, and a perfect 9-0 season in Atlanta. Burrell with the big homer (career #250) as Phils win every game in Atlanta they played in 2008. Mets won to keep pace. Phils have the 5th best ERA in baseball, so it's not always about the hitters. Now they go to Florida for three with the former contenders, who are fading out of the races. Phils lose, Mets win, and we're back in second place. But we're still two games up in the Wild Card race as the Brewers are still reeling. Time for Blanton to show that the trade for him wasn't a total waste. Phils win, Mets lose as their bullpen collapses yet again, the lead is up to a game and a half. Phils' 44th road win of the season, the rest of the regular season is back home. Mets play the Cubs, who've already clinched, but they do plan on playing their regulars. Phils won, Mets lost, and now it's the New Yorkers who are checking the Brewers results and thinking Wild Card. Our magic numbers are 3 and 4. Going for win #90 tonight. Phils with a sloppy loss, Mets actually win a game, and the lead is down to a game and a half. Elsewhere, John McCain announces he's suspending his campaign due to the financial crisis. Myers awful again, but at least the Mets blew their chance and lost too, they're now tied for the Wild Card with Milwaukee. Off day for the Phils, but follow the other games here. Lou Pinella finally rested a bunch of guys as the Cubs lose to the Mets, the Brewers win too. Entering a storm-threatening final weekend the Phils are up a game on the Mets. Once again, like in '07, it's the Phils at home vs the Nats and the Mets at home vs the Marlins. Will it come down to the final game again? We can't be that lucky again, can we? Phils win, then we all hung around to follow the Mets loss and the Brewers win. Magic number is down to 1 for us. Mets start 3 hours earlier, weather permitting. They're starting Johan Santana, next to last scheduled game at Shea.